2. The current AMA Safety Code is in effect at all times. The following rules are OCMA specific rules and apply in addition to the current AMA Safety Code. 3. The Field Marshal has the authority to suspend a pilot for the day, take the pilots badge, or report the pilot to the board for disciplinary action. If, at the request of a Field Marshal, the pilot refuses to tender their badge and/or threatens violence they shall be immediately and permanently removed from OCMA. 4. All flying shall be done in a safe and orderly manner. No Pilot shall fly in a reckless manner which endangers themselves or others. 5. 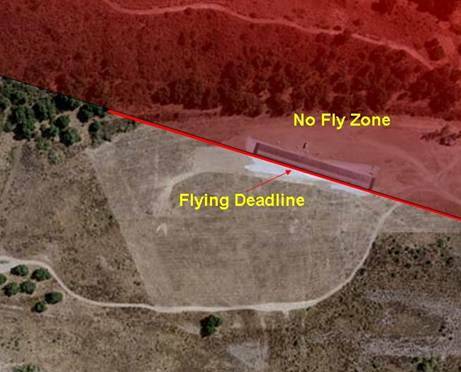 Observe the established No-Fly Zones. Flying is PROHIBITED in these areas at ALL times. Flying over unprotected people is strictly PROHIBITED. 6. NO TURBINES ALLOWED, FIXED OR ROTARY WING. 10. Each OCMA member is VERY STRONGLY encouraged to avoid flying alone. b. Flying guests MUST have 2010 AMA and post it. No AMA card posted, No Fly. f. Each member must their OCMA badge while at the field and not flying. (72 MHz flyers must place badge on the frequency board while flying). 15. Speed Limit 10 MPH Violators will face disciplinary action. 16. If dusty conditions exist, you must slow down to create a minimum amount of dust (5 MPH). 17. Everyone must have a Fire Extinguisher and be accessible when flying. a. They damage something, you pay. 25. Field marshals are empowered to enforce these rules. 1. 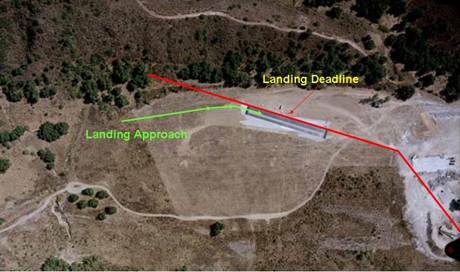 Fixed wing flight ops will be done at the fixed wing site. a. No fixed wing flying at the heli pad, except for true flat foamiest. b. True foamiest can be flown in the area between the fixed wing site and the heli pad near the block house and containers. 3. Pilots must stand on the Pilot Stations while flying. Only the pilot, student, and observer/spotter are allowed at each Pilot Station. 4. NO FLYING OR HOVERING OVER THE RUNWAY. 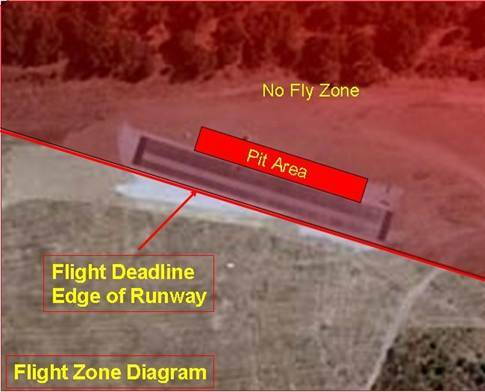 The runway is in the designated No-Fly Zone and is to be used for take-off and landing only. 5. Hover over the pad provided at the far edge of the runway! 6. Deliberate flying behind the Flight Zone Deadline or Landing Deadline is prohibited. 7. A "See and Avoid" policy relative to full scale traffic will be in effect at all times. Full scale traffic will ALWAYS have the Right-of-Way. 8. When in doubt of the intentions of full size aircraft or helicopters as they approach the model aircraft runway area LAND IMMEDIATELY! 9. If there are Fire Fighting operations (water dipping helicopters), or Mountain Rescue helicopters practicing on the hills you must land immediately. 10. There shall be a maximum of five aircraft aloft at any time. 11. Aerobatic flying shall be performed away from the runway and shall never cross the Flight Zone Deadline. 12. All pilots shall fly the designated take-off and landing patterns. Initial take-off direction shall be down the centerline of the runway and away from any spectators. Aircraft shall not takeoff before reaching the Takeoff Line on the runway. 14. Avoid high speed inbound turns towards the pits. Ensure that loss of control or airframe failure will not result in your aircraft continuing on into the pits. 16. 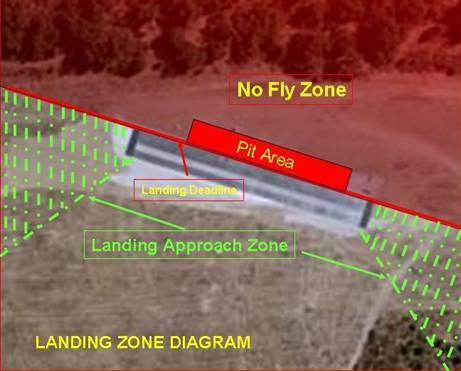 All fixed-wing aircraft with propellers and smaller than 50cc shall be located on the pit area adjacent to the runway AND be pointed toward the runway during and after the engine start-up process. Pilots shall take care not to start the engine until the area in front of the aircraft is clear of bystanders that may be injured should a propeller leave the engine while it is running. 18. Aircraft with 50cc or larger engines MUST have a holder or secondary restraining device such as heavy-duty strap anchored firmly. 19. Aircraft with engines smaller than 50cc may be held by the person starting the aircraft, but proper restraint or a holder are highly recommended. 21. Never reach across the propeller arc to unplug a glow driver, rather move to the rear of the plane and remove the glow driver from behind the propeller. 22. Non-OCMA members that are “Student Flyers” (meaning under the direct supervision of an OCMA member) are welcome to flight instruction at the field provided they are an AMA member. 23. Pilots should try to have a spotter available when flying. The determination of the need for a spotter for a pilot will be at the discretion of an OCMA Field Marshal. 24. Take-offs and landings are to be from right to left into prevailing wind (unless wind conditions dictate otherwise). 25. Pilots must make appropriate announcements of “taking off”, “landing” or “dead stick or emergency landing” in an emergency. 27. When returning from the runway onto the taxiway after flight, you shall turn your motor off prior to passing the safety fence. 1. All Helicopter flying is restricted to the 2.4 GHz Frequency. 2. No Heli 3D or non-pattern/FAI Heli flying at the Fixed Wing site. 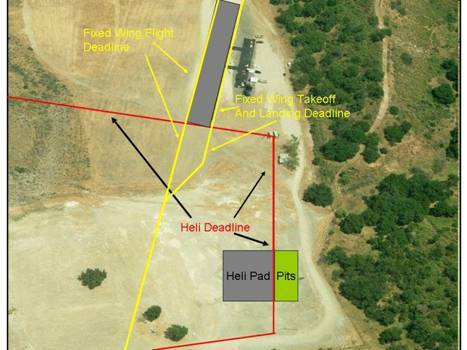 Heli Pattern/FAI style may be flown at the Fixed Wing site, all other Heli flying shall be done at the Heli Pad. 8. A Heli pilot may not operate the craft in a manner to interfere with fixed wing operations, or in an unsafe manner. No flying over the fixed wing site. 9. This is at the discretion of the Field Marshal. 10. Any pilot flying electric helis must observe the battery safety precautions outlined elsewhere in the rules. 11. The frequency control policy previously introduced in this document shall be in effect for the helicopter flight zone. The following diagrams illustrate the approved flight zones. 2. A Member using 72 MHz must wear his/her OCMA Membership Badge on their person until they are prepared to fly, then place their badge on the frequency board in the correct position according to the channel number. 3. Use of the frequency is limited to 20 minutes, including troubleshooting. Flight time is limited to 20 minutes, even for systems using 2.4GHz. 4. Operating your transmitter before acquiring the frequency is STRICTLY PROHIBITED. If you violate this rule and cause damage to or loss of another’s aircraft you are financially responsible and shall make FULL compensation to affected parties. Failure to make compensation will result in suspension or dismissal from the Club. 5. If your transmitter is on 2.4GHz, then wear your OCMA Membership Badge on your person while you are at the flying field and also when flying. 6. Each transmitter must be narrow band (72MHz aircraft frequencies only). However, the six-meter band and 2.4GHz band are exempt from this rule. 7. All Helicopter flying is restricted to the 2.4 GHz Frequency. Each member must unlock the entrance gate to enter and then must lock the gate before continuing to the heli and fixed wing area. When leaving the flying area each member must lock the entrance gate after exit. Do not tamper with, break or alter the lock. Lost gate keys will be replaced for a $50.00 fee. Gather all trash and place it in the dumpster that is provided. IT IS YOUR RESPONSIBILITY TO KEEP THE FIELD CLEAN. The first person arriving at the field must open safety lockbox and the last person leaving the field is responsible for securing the safety lockbox. IN ORDER TO MAKE AN EMERGENCY CALL WITH YOUR CELL PHONE, DRIVE BACK DOWN THE ACCESS ROAD TOWARDS SILVERADO CANYON. CELL PHONE ACCESS IS BEST AT THE FORK IN THE ROAD NEAR THE ACCESS ENTRY. Follow Blue Diamond Road to the end.